Jess gets crafty: Happy (late) Easter! I'm really sorry that there has been such a long gap since my last post - there has been crafty news to share but unfortunately illness in Tea Towers has prevented me from sharing any of it until now. It seems that Easter caught me unawares this year and I didn't get around to making anything for family gifts apart from these little (very little - only size A7, that's an eighth of the size of A4) butterfly cards to send out with a few small Thornton chocolate bars. 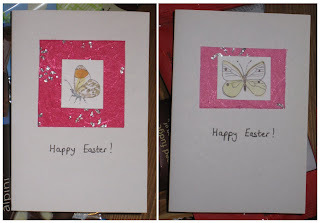 I really love making my own cards though - and these were really easy as I just recycled a butterfly card that I received a few years ago which had 9 lovely little butterfly watercolours on. In other crafty news I'm still working on my little boy's cot bed blanket... I've very, very nearly done as I've made all the squares, joined them and added a simple plain border... but I'm being a little useless about weaving in the huge number of ends. Hopefully I'll get it all finished off in the next week or so and be able to take some decent photos of it to post here. I'm really proud of how it has turned out and I can't wait to share it! This has got to be a short post as I have a baby who needs his food now - but I'll try to get my next post up in the next week or so. Hi! Good to read you back posting. Some gorgeous pictures on your slideshow. I'll send weaving vibes for all those ends!